Beerkada Comics » The cover for the 8th Beerkada book. The cover for the 8th Beerkada book. 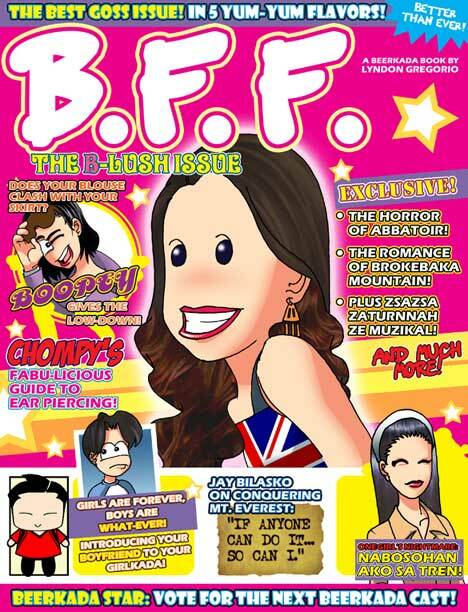 BFF, the 8th Beerkada book, will be available March 2008. And there goes the male demographic. Now how will I buy it with my dignity intact? I though you were going to follow a Gatchaman theme? There’s no place for softness here in SPARTA! I mean the internet. And that rehaz, my little engineer, is an example of a good idea yesterday and a bad idea tomorrow. A little too late if they’re printing it now. Let’s say they do print an alternate cover for that compilation. They might be printing the same number of copies as the one they released before. It is true that die hard beerkadets will buy both versions but you have to think about the casual buyer. You are making sure that you have the same number of buyers but twice or less the cost. There would be more leftover copies after all is done and Lyndon’s earnings has a high possibility of being less than what it could be because of the bigger cost to print out a second version. EFF YEAH COMMERCE! I just predict that the payout will be too small to consider. Limited editions should be done after a year or so. We have to wait some time after the customers lend their copies to neighbors or cousin and never get them back or worse. Then they’ll be ripe for the picking. You’re new to being a ruthless strategist/monster aren’t you? And you use the ellipses too much. Para matapos na ito, meron nang advisor si Lyndon ok? So walang vacant position. I just wished he cried on hearing/reading that piece of information. Human tears are one of components that power my engines. I want to buy the 7th and 8th books but I can’t seem to find it in National book store. man this is great! its ok if its a girly type Mag! man im gonna buy one for my girl! And I’m gonna buy that power drill for my girlfriend!